I have not prepared much from Andhra cuisine and my thinking has been limited to this "Traditional Andhra cuisine means spicy, hot dishes with a tangy taste". 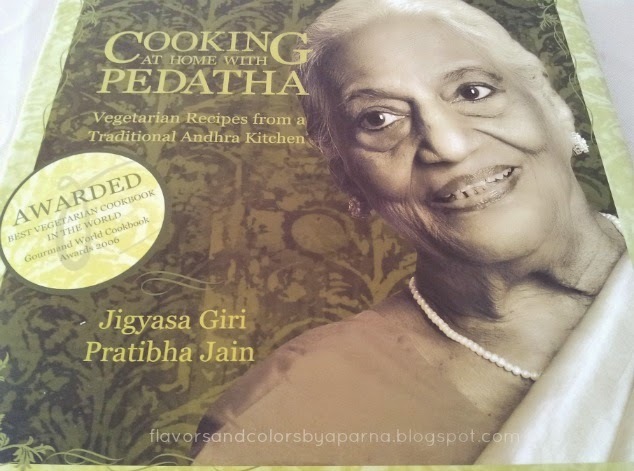 During my Bangalore visit, when I asked my Telugu friend for an authentic Andhra cookbook she referred to me this book with vegetarian recipes from a traditional Andhra Kitchen titled "Cooking at home with Pedatha". She was going on and on about the wonderful recipes in there and how it helped her to overcome her kitchen fear as a novice cook. And so here is my copy. Thanks "L" for suggesting this book to me. This award winning cookbook, is beautifully written by the authors Jigyasa Giri and Pratibha Jain. It includes array of recipes that are fairly easy to follow with step by step guidelines and visually appealing photos of ingredients and the dish in its final step. There are special tips besides recipes running throughout the book. The portraits of Pedhata at the beginning of each chapter reflects her joy for sharing her recipes and guiding us with love. "Beerakaya Pesarapappu" is the first dish that I tried from this book. 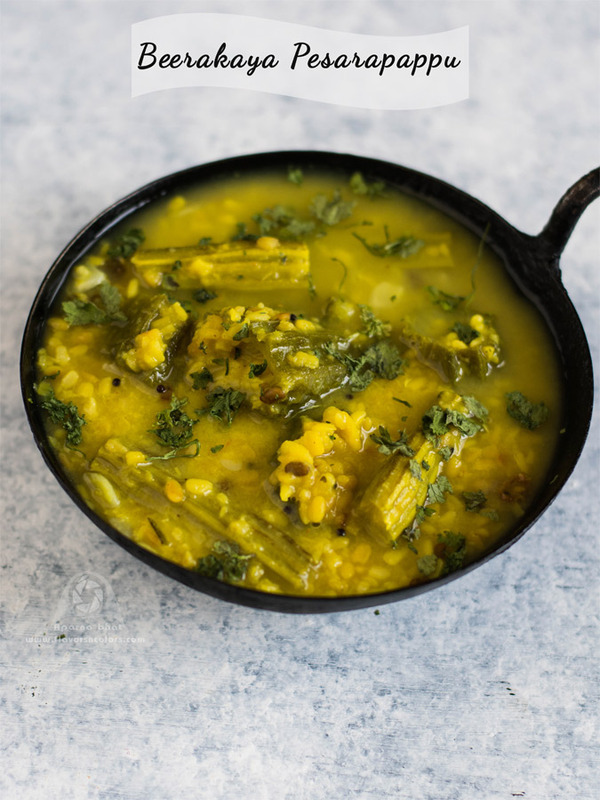 A nutritious dal prepared with split yellow moong dal, I have adapted Pedhata's recipe and adjusted the spicy levels as per my family preference. To know the exact recipe you will have to buy the book and refer it. 1 cup cleaned scraped and chopped drumsticks, each piece about 2 "
Wash ridgegroud and scrape the rough edges of it [ Keep these edges which can be used to make chutney]. Now chop the gourds into small 1" cubes. Dry roast moong dal for few mins till you get nice aroma. 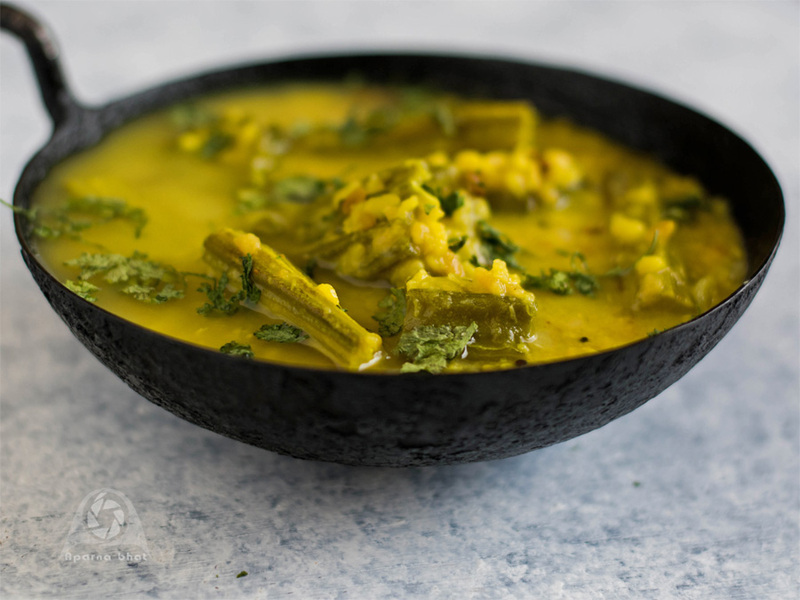 Pressure cook it along with ridge gourd cubes and turmeric powder. Cook it for 2 whistles and simmer the flame. Switch off the flame after 10 mins. Let the steam escape naturally before taking out the dal from cooker. In a pan, heat ghee for tempering. Add mustard seeds and allow it to pop up. As they pop up, lower the flame, add fenugreek seeds and fry it till they turn brown in color. Add red chillies, and as they turn bright red stir in the curry leaves and asafoetida powder. Add the chopped drumsticks, cover and simmer for few minutes till drumstick are done soft. Now add the boilded moong dal ridge gourd mixture, slit green chilli, salt to taste and continue to cook on sim flame for few mins until done. Once done switch off the flame, stir in the lemon juice and garnish with coriander leaves. Relish it hot with rice and pappad or as sidedish with rotis. its one of my favorites. pedatha is like a mother to Andhra cuisine. Glad u liked the recipe! thnks Madhavi K... Yes i too felt the same as u mentioned,,A motherlike figure trying to share her recipes lovingly ! very inviting and healthy curry.. Love it..
What a unique recipe, i think i must try this. I love Andhra cuisine very much, wat a beautiful pappu..am in love with ur clicks..
thnks Priya S for compliments !